The Romance Dish: Regency Charmers! 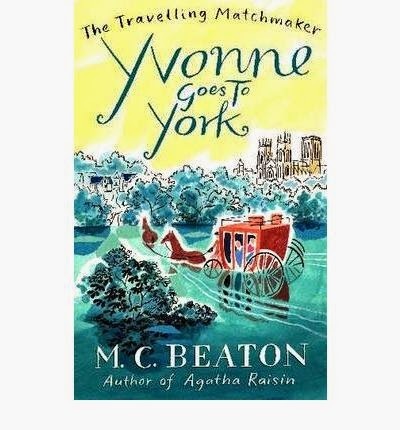 Today I'm going to talk about some wonderfully charming trad Regencies by British writer M.C. Beaton. M.C. 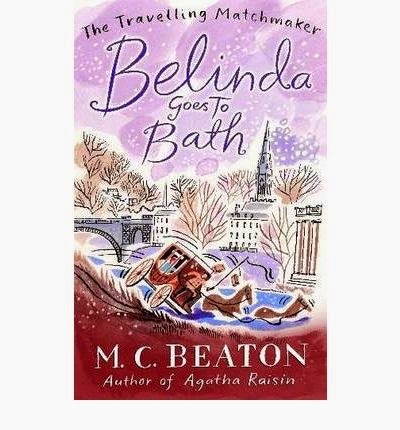 Beaton these days is mainly famous for her Hamish Macbeth and Agatha Raisin cozy mysteries. I haven't read either series, although I loved the BBC version of Hamish Macbeth that was on TV some years ago now and featured a young and very charismatic Robert Carlyle in the title role. It turns out that M.C. Beaton also had a long and illustrious career as Regency romance writer Marion Chesney. I know this because when I mention these books to diehard fans of the genre, they all start gushing. Anyway, as a result of M.C. 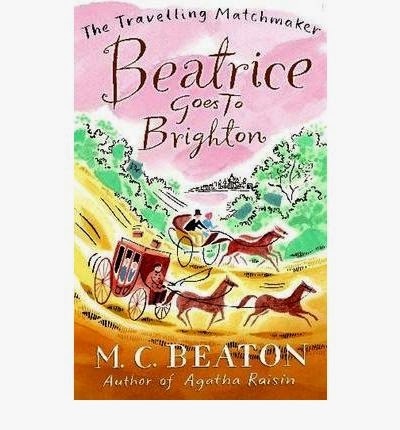 Beaton's crime novel success, the Regencies are now freshly available to a whole new audience. I like how I discovered these books. In April, my U.K. publisher Mills and Boon had a special on SEVEN NIGHTS IN A ROGUE'S BED and as a result, my book hit the top of a couple of Amazon lists (yay!). A book I'd never heard of called EMILY GOES TO EXETER (also on special) knocked me off my number one perch on the Regency list. Out of curiosity, I ordered Emily. And found myself immediately enchanted. Honestly, if a book had to knock me down a peg or two, I don't mind if it's as good as this one. Hannah Pym, the Traveling Matchmaker of the title. Hannah has been a servant all her life until her morose, reclusive employer unexpectedly leaves her a legacy of £5,000. Hannah has always longed for adventure (I think of the start of "I Have Confidence" from the SOUND OF MUSIC when I read these books, about the longing for adventure, but the fear that comes when adventure finally turns up!). So she decides to head off on the stagecoach to Exeter in Devon. On the journey, she encounters interesting people including a disgraced heiress (the Emily of the title) and her rejected suitor, Lord Ranger Harley. Who ends up not being rejected at all, thanks to Hannah's machinations. It's fun, it's charming, there's some lovely sexual tension, although true to the trad Regency genre, anything that happens in the bedroom happens behind a closed door. I can see why Beaton ended up writing successful cozy mysteries. The structure of these Regencies isn't that different to the classic country house murder story. On each journey, Hannah meets a distinct group of people who all get involved in each other's lives through happenstance - a highwayman's hold-up, a carriage accident, bad weather. Events conspire to keep them together in a distinct location long enough for the plot threads to twine together. In the end, we have a lovely happy ending where instead of the bad guy being caught, generally it's some eligible lord or other! 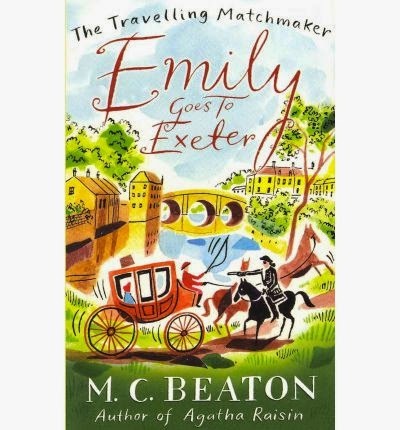 Hannah so enjoys her trip to Exeter, that she embarks on another five journeys, all of which give her the chance to exercise her knowledge of human nature, honed through years as a housekeeper, and her matchmaking skills. There's also danger and suspense and mystery along the way to keep the stories bubbling along like a nice rich beef stew. 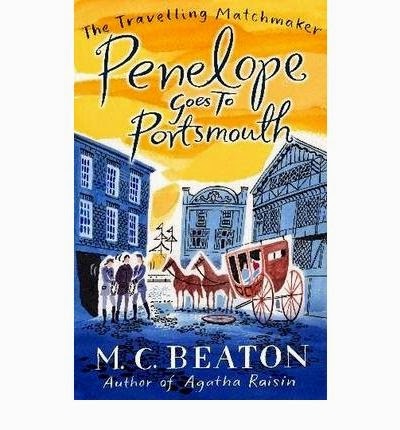 Hannah's adventures continue in BELINDA GOES TO BATH, PENELOPE GOES TO PORTSMOUTH, DEBORAH GOES TO DOVER, BEATRICE GOES TO BRIGHTON, and YVONNE GOES TO YORK. There's also an overarching plot about Hannah's seemingly impossible love for Sir George Clarence, her late employer's dashing brother, who takes an interest in this unusual woman who has such zest for life. This strand of the series has a lovely sigh-worthy ending that's well worth waiting for. I discovered these books when I was deep into deadline mode. They're just perfect for those moments when you want to escape bumps in the road of life. They're funny - I laughed at loud at least once in every single one and I lost count of the smiles. They're also a great length if you're stuck for time. I'm not quite sure how M.C. Beaton manages it, but she packs an awful lot of character and plot and romance and adventure into something as long as a category romance. They're quick reads in the best sense - like a small holiday when you need one and you can't get away to Portsmouth or Bath or Exeter! 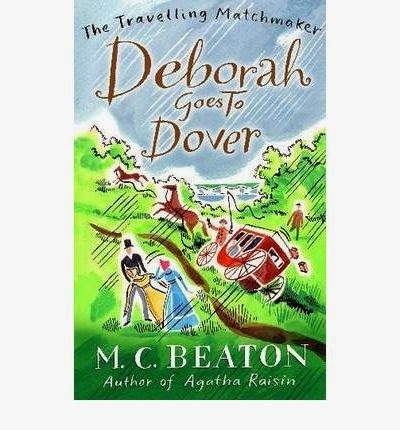 So if you want something fresh and funny and romantic to read, I'd highly recommend the Traveling Matchmaker series by M.C. Beaton. Traditional Regencies seem to be making a bit of a comeback, partly due to the digital revolution. Do you enjoy this genre? Do you have any favorites? Any recommendations of books for me to try once I get to the end of M.C. Beaton's LONG backlist? Have never read a regency. But love the titles and covers on these Beaton books. Pat, what a lot of great books you've got ahead of you. Most of the historicals published by the trad publishers these days are set in the Regency (including mine!). Aren't those covers great? These sound absolutely CHARMING. Must find! Helly, bet you love them! I was just enchanted. So glad I found them. PJ, there was a Kindle special if you bought a couple of these together - hope it's still on. Hope you enjoy - think these might be up your alley. Carla Kelly and Mary Balogh sit near the top of many readers' lists of favorite trad Regency authors. PJ, because trad Regencies weren't really available in Australia, aside from Georgette Heyer and Claire Darcy, I missed out on some really great stories. I love Loretta Chase's trads - I've re-read a couple of those over and over. I do have a couple of her books in my tbr pile (not these though) and should give them a try when I'm looking for some lighter reading. I must admit I usually go for books with more angst lol. Catslady, my life had enough angst at the time that I picked these up. They made a lovely escape! I have tons of traditional Regencies on my keeper shelves, and I have been happily replacing the tattered paperbacks with digital copies as they become available. I've read most of Marion Chesney's trads. I think the Six Sisters books are the ones I remember best. I think of her books as good dessert books-light, sweet, fun, but not substantial. I started reading Mary Balogh, Jo Beverley, and Mary Jo Putney when they were writing their first books, all trads, and they remain among my favorites. Carla Kelly is superb. Several of hers are on my all-time top 100 list. Reforming Lord Ragsdale, Mrs. Drew Plays Her Hand, and Libby's London Merchant/One Good Turn are my favorites by CK. Edith Layton is another favorite. I'm really excited that more of hers will be released digitally soon. I practically danced with delight when Anne Gracie's Gallant Waif and An Honorable Thief were recently released in digital format. Now if only Tallie's Knight joins them. My digital trad purchases include books by Candice Hern, Dianne Farr, Alicia Rasley, Barbara Metzger, Donna Lea Simpson, Joan Smith, and Anita Mills. I'd love to see ereleases from Shelia Simonson (She has a few), and Judith Nelson, who wrote my all-time favorite funny trad--Kidnap Confusion. I know I'm leaving out great ones--Nancy Butler, Patricia Oliver, Joan Wolf . . .
Janga, light and fun were just the ticket at the time. I've got the six sister books waiting for me next but I've put off starting them because if they're like the traveling matchmaker series, I'll do nothing else but read them until I get to the end. Thanks for the recommendations. I"m hoping to get a Kindle soon (yeah, I know I've said that before) and I notice that a lot of these books are freshly available in digital format. Wow, you really ARE a trad Regency fan! I was waiting for you to check in, Janga. Knowing how much you love the trad Regencies I was sure you'd have some great suggestions! I have the paperback version of Anne Gracie's Gallant Waif that I found in a second-hand book store a few years ago. It's one of my favorites! PJ, I really enjoyed Gallant Waif too. Really touching story. I am also going to say that I think these books sound charming and fun. I am going to look them up as soon as I leave here. I love the covers....whimsical and charming. Is Julia Quinn considered a trad Regency? She wrote my favorite book ROMANCING MR. BRIDGERTON. I didn't discover Regencies until 20 years ago. I read trad romance from Harlequin. Deb, so glad you enjoy the reviews. I really like doing them! It's nice to talk about a few things that might have gone under people's radars or things that are classics. I'm doing a real classic next month - Daphne Du Maurier's Rebecca! Julia Quinn is considered a Regency historical largely because she writes longer book with more explicit sexual content. Trad Regencies tend to be comedies of manners based around the romance whereas Regency historicals are all about the romance, baby! :-) Hope you enjoy these books. I thought they were so fresh and funny! Deb, I think the lack of overt sexual content is one of the things that sidelined trad Regencies in the 90s and 2000s when the demand was for hotter books. But thanks to the digital revolution, niche markets like this can actually be quite lucrative away from the big six publishing houses. Anna, these sound like fun! I have a friend who could use a lift right now, so I'm going to check these out. Nancy, they definitely put a smile on my face! I hope your friend enjoys them. Thanks for a fun day of blogging! See you all next month! I picked up a copy of her Hamish Macbeth Christmas mysteries a while back. Don't think I have read any of her others. I do enjoy the traditional Regencies. The good ones are a nice break from the explicit nature of newer books. I enjoy both, but something light and less intense is enjoyable, a bit like tea and cookies instead of a dark and decadent chocolate dessert. I will have to look for this series. It sounds like one I'd enjoy. I would add Kasey Michaels and Jane Oliver.